ML809 sonic electric toothbrush change your habit of brushing teeth, which more effective, cleaning. You can observe the affection obviously that tartar was decrease and teeth get white when you use our toothbrush one week. ML809 adopt maglev sonic wave technology, toothpaste is decomposed quickly by 31000 times/min vibrational frequency toothbrush’ head. Meanwhile, the vibration improve blood circulation and massage your gum. ML809 provide 3 modes(cleaning mode, gentle mode, massage mode) for you, has automatic memory system, it will change the frequency automatically to last frequency you use in every starting, make you enjoy brushing. ML809 set 2 minutes automatically when you start it, will pause and change area in every 30s(ML809 divide the teeth into 4 areas) for deep cleaning for teeth. It still work 5s after 2 minutes setting time for cleaning the whole toothbrush. ML809 toothbrush’s head is made of food grade ABS material and bristle is made of American DUPON bristle, you do not worry out your teeth get hurt because every single bristle had been round off finely. ML809 adopt wireless inductive charging, high power lithium battery is placed inside the ML809, so it can run about 30 days on a single charging. You can put ML809 in bathroom and wet environment because it is waterproof grade IPX7. 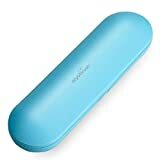 its effectiveness of quiet make the sound less than 55 decibel. 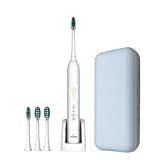 ML809 provide 4 toothbrush’s head for you, which make you enough to use in one year. According to dentists, toothbrush’s head should be replaced in every three months. If you have any question please contact us, we will try our best to give you the best service.